What Became of Albert Einstein's Brain? On April 18, 1955, the great mathematician and physicist Albert Einstein died. He was 76 years old. Although Einstein's body was cremated, his brain was saved. Dr. Thomas S. Harvey, a pathologist at Princeton Hospital, removed Einstein's brain on the morning of Einstein's death. What happened to the brain for years after this is somewhat of a mystery. There are several published scientific studies that have examined Einstein's brain. One of the first papers, titled "On the Brain of a Scientist: Albert Einstein" was published in 1985 in the journal Experimental Neurology (vol. 88, pages 198-204, 1985) and written by Marian C. Diamond, Arnold B. Scheibel, Greer M. Murphy and ...Thomas Harvey! These scientists counted the number of neurons (nerve cells) and glial cells in four areas of Einstein's brain: area 9 of the cerebral cortex on the right and left hemisphere and area 39 of the cerebral cortex on the right and left hemisphere. Area 9 is located in the frontal lobe (prefrontal cortex) and is thought to be important for planning behavior, attention and memory. 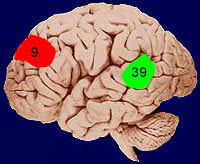 Area 39 is located in the parietal lobe and is part of the "association cortex." Area 39 is thought to be involved with language and several other complex functions. The ratios of neurons to glial cells in Einstein's brain were compared to those from the brains of 11 men who died at the average age of 64. The authors concluded that the greater number of glial cells per neuron might indicate the neurons in Einstein's brain had an increased "metabolic need" - they needed and used more energy. More recently, other researchers have noticed differences in glial cells (e.g., larger astrocytic process) in Einstein's brain. In this way, perhaps Einstein had better thinking abilities and conceptual skills. Scientists are trained to read published papers carefully and to evaluate the methods, results and conclusions of experiments. Although it is intriguing to use the results of this paper as an indication that Einstein's genius was related to a particular brain region, it is perhaps a bit too early for such a statement. First, the "normal" brains that were compared to Einstein's may not have been the best group for comparison. The average age of these brains was 12 years younger than Einstein's brain. In fact, the youngest brain in this group was only 47 years old. It is possible that the neuron to glial ratio seen in Einstein's brain was quite normal for his age and that the younger comparison group just did not show these changes yet. Also, the paper did not describe the background of the comparison group. What was their intelligence and cause of death? Would these factors have anything to do with the observed brain differences? Second, the "experimental group" had only one subject...Einstein! Additional studies are needed to see if these anatomical differences are found in other people with conceptual and mathematical skills like Einstein. Third, it appears that only a very small portion of the four areas of each brain was studied. The paper states that "Four to six sections were cut from each block, Einstein's and the controls?." However, after staining, only ONE section from each block was studied! There is no indication that this single thin section was obtained from similar regions of area 39 and area 9 from the different brains. It is even unclear how much of each section was counted. Moreover, only the ratio of neurons to glial cells was published. The total number of cells that were counted is not given in the paper. This is important to get an idea of how the experimenters came to their conclusions. It is important to remember that the areas 9 and 39 make important connections with many other areas of the brain. To assign a particular behavior or personality to a single brain area is too simple. Parts of the brain do not act by themselves. Rather, complex behavior is the result of many areas acting together. A second paper (Neuroscience Letters, 1996) describing Einstein's brain was published in 1996. Einstein's brain weighed only 1,230 grams, which is less than the average adult male brain (about 1,400 grams). The authors also reported that the thickness of Einstein's cerebral cortex (area 9) was thinner than that of five control brains. However, the DENSITY of neurons in Einstein's brain was greater. In other words, Einstein was able to pack more neurons in a given area of cortex. Another study concerning Einstein's brain was published in the British medical journal The Lancet (vol. 353, pages 2149-2153) on June 19, 1999. In this paper, the external surface characteristics of Einstein's brain were compared to those from the brains of 35 men (average age, 57 years old). Unlike the brain of these 35 men, Einstein's brain had an unusual pattern of grooves (called sulci) on both right and left parietal lobes. This particular area of the parietal lobe is thought to be important for mathematical abilities and spatial reasoning. Einstein's brain had a much shorter lateral sulcus that was partially missing. His brain was also 15% wider than the other brains. The researchers think that these unique brain characteristics may have allowed better connections between neurons important for math and spatial reasoning. In 2012, photographs of the external surface of Einstein's brain were analzyed and published in the journal Brain. Scientists who studied these photographs noted that compared to other brains, Einstein's brain had a larger prefrontal cortex and expanded primary somatosensory and motor cortices especially in the face and tongue areas on the left hemisphere. In 2013, photographs through the middle (midsagittal section) of Einstein's brain were used to compared the size of Einstein's corpus callosum to that of right-handed, age-matched men and to a younger group of right-handed men. In this study, Einstein's corpus callosum was found to be thicker in most areas compared to the corpus callosum of age-matched men and thicker in a few areas compared to the corpus callosum in younger men. Although these results are interesting, it must be remembered that this study had only ONE brain in the experimental group...Albert Einstein's brain. It remains to be seen if other mathematical geniuses also show these distinguishing brain characteristics. Moreover, the study did not investigate the brain at a microscopic level. In other words, the study says nothing about how neurons in these brains were connected and of course, could not tell if there were differences in the way the neurons functioned. The importance of these differences is still unknown. There are still many questions about how the brain constructs personality, builds intelligence and forms creativity. Further research using modern brain imaging techniques (MRI/PET) that look at the anatomy and function of the brain in living geniuses may reveal what makes these people such giants. The brain of Vladimir Ilyich Lenin was also studied by scientists. Lenin, who was leader of the Russian revolution in 1917, died in 1924. His brain was removed before his body was laid to rest in a mausoleum in Moscow. The Soviet government commissioned the well-known German neuroscientist Oskar Vogt (born 1870, died 1959) to study Lenin's brain. Vogt spent two and a half years preparing and studying Lenin's brain. He finally published a paper on the brain in 1929 where he reported that some neurons (pyramidal neurons) in layer III of the cerebral cortex of Lenin's brain were very numerous and large. For more information about Lenin's brain, see: The Study of Lenin's Brain and Bentivoglia, M. Cortical structure and mental skills: Oskar Vogt and the legacy of Lenin's brain, Brain Research Bulletin, 47:291-296, 1998. Albert Einstein was born on March 14, 1879, in Ulm, Germany. Anderson, B. and Harvey T., Alterations in cortical thickness and neuronal density in the frontal cortex of Albert Einstein, Neurosci Lett., 210:161-164, 1996. Colombo, J.A., Reisin, H.D., Miguel-Hidalgo, J.J. and Rajkowska G., Cerebral cortex astroglia and the brain of a genius: a propos of A. Einstein's, Brain Res Rev., 52:257-263, 2006. Diamond, M.C., Scheibel, A.B., Murphy, G.M., Jr. and Harvey, T., On the brain of a scientist: Albert Einstein, Experimental Neurology, 88: 198-204, 1985. Falk, D., Lepore, F.E. and Noe, A. The cerebral cortex of Albert Einstein: a description and preliminary analysis of unpublished photographs, Brain. 2012 Nov 16. Hines, T., Further on Einstein's Brain, Experimental Neurology, 150:343-344, 1998 - this is a short paper published in April, 1998 by Dr. Terence Hines. Dr. Hines discusses some of the problems with the Einstein paper published in 1985. Witelson, S.F., Kigar, D.L. and Harvey, T., The Exceptional Brain of Albert Einstein, The Lancet, 353:2149-2153, 1999. Lepore, F.E., Dissecting Genius: Einstein's Brain and the Search for the Neural Basis of Intellect, Cerebrum, New York: Dana Press, 3:11-26, 2001. Abraham, C., Possessing Genius: The Bizarre Odyssey of Einstein's Brain, New York: St. Martin's Press, 2002. Paterniti, M., Driving Mr. Albert: A Trip Across America with Einstein's brain, New York: Dial Press, 2000. Copyright © 1996-2017, Eric H. Chudler All Rights Reserved.